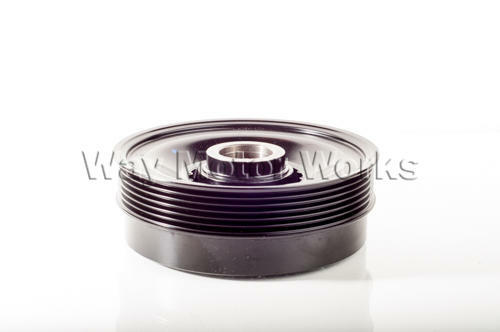 OEM Harmonic Balancer Crankshaft Damper Pulley for 2002-2006 R53 MINI Cooper S and 2005-2008 R52 MINI Cabrio S. As many know these crank pulleys fail as they get older and the rubber drys out. When this happens you will commonly smell burning rubber, loose the belt, and the cars go into limp mode. So if this has happened to you here is the OEM MINI crank pulley replacement. This is not a cheap aftermarket part, but an original part from MINI.